Well, this is going to do nothing for my figure, but it sure does provide some comfort! I’ve made this soup twice in the last couple of weeks, and we eat on it for days! 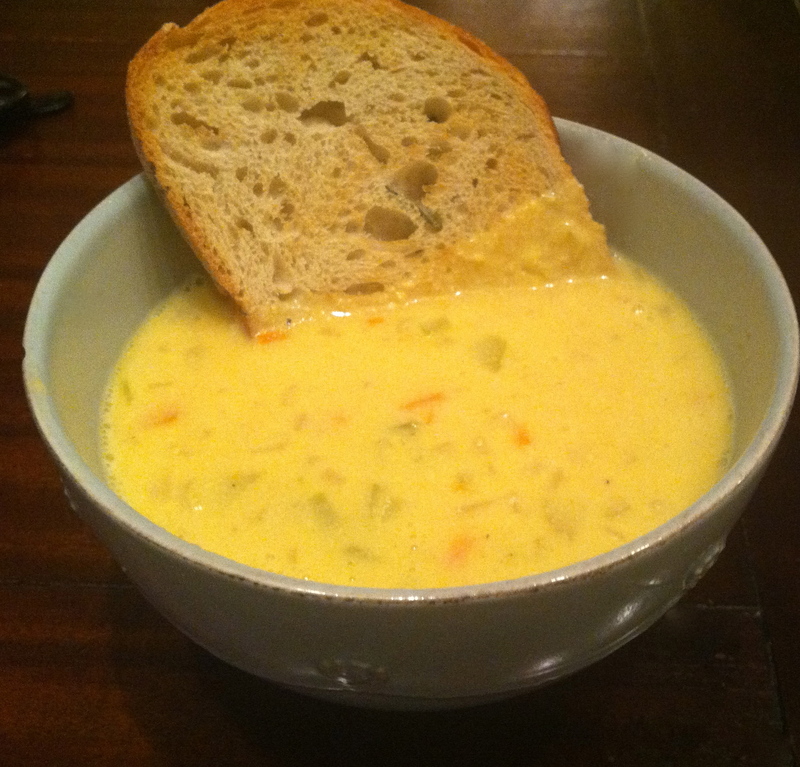 After researching and discarding tons of recipes for Beer Cheese Soup, this is the one that I decided to make. I found it on AllRecipes.com, and it’s a winner! I like to serve this with slices of Whole Foods Rosemary Garlic bread…to. die. for. In a large saucepan over medium heat, stir together carrots, onion, celery, and garlic. Stir in hot pepper sauce, cayenne pepper, salt, and pepper. Pour in chicken broth and beer; simmer until vegetables are tender, about 12 minutes. Remove from heat. Meanwhile, heat butter in a large soup pot over medium-high heat. Stir in flour with a wire whisk; cook, stirring until the flour is light brown, about 3 or 4 minutes. Gradually stir in milk, whisking to prevent scorching, until thickened. Remove from heat, and gradually stir in cheese. Keep warm. Stir beer mixture into cheese mixture. Stir in Dijon mustard, Worcestershire sauce, and dry mustard. Adjust for hot pepper sauce. Bring to a simmer, and cook 10 minutes. Serve topped with popcorn. YEA, this soup sounds yummy! I can’t wait to try it.